10 YEARS THE BEST OF BDE! 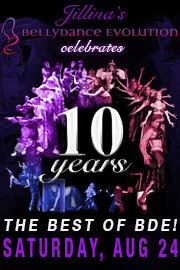 Join Bellydance Evolution as they commemorate their 10th Anniversary! BDE will perform some of the most memorable pieces from all of their productions featuring stars such as Sharon Kihara, Kaeshi Chia and more! Come and celebrate with BDE as they take a look back on the last decade of friendships and connections made with dancers from all over the world and get a sneak peek at inspiring new projects. All contents copyright © 2008 El Portal Theatre. All rights reserved.